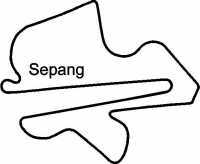 Sepang Circuit graphic decal / sticker. The Sepang International Circuit (SIC) is the venue used for the Formula One Malaysian Grand Prix, A1 Grand Prix as well as the Malaysian Motorcycle Grand Prix. It is also used as a venue for many other major motorsport events. Nicky Hayden testing the Honda RC212V at the Sepang International Circuit. The leader board at the Sepang International Circuit.Widely regarded as a benchmark for other Grand Prix venues, the Sepang circuit boasts superb pit garage and media facilities, as well as impressive grandstands and patron amenities.